Morgan presented to our office after moving to AZ from FL. At the time she had existing porcelain veneers that were approximately 9 years old and she was unhappy with the appearance of her smile. Her existing veneers had some issues – all four veneers exhibited marginal leakage (staining) from improper bonding, the veneers appeared a little bulky, and the shape was not quite right for her face. We debated between completely redoing her smile with 8-10 veneers or simply redo just her front 4 veneers with stronger and better looking porcelain. Ultimately, we decided to be more conservative as she was pretty happy with the rest of her smile. 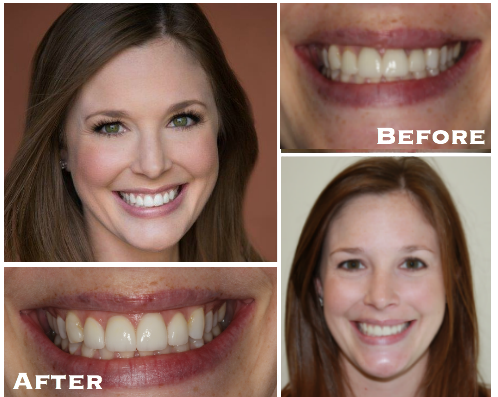 We were able to simply redo her porcelain and the final result looks beautiful and much more natural in appearance. Dr. Gombert and his team at Parkside Dental Health are absolutely amazing! Every time I walk into his office, I’m welcomed by friendly staff, and receive excellent customer service throughout my entire experience. Dr. Gombert and his staff have repeatedly taken the time to make sure I understood every part of the process, my questions are answered, and I’m extremely happy with the outcome. My smile is very important to me, and I am grateful to Dr. Gombert for helping me to love my smile again. Thank you!